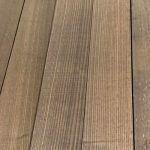 Cambia Ash Decking - St Angelo Hardwoods, Inc.St Angelo Hardwoods, Inc.
Thermally Modified ash decking has become a very popular item with designers and architects throughout the country in recent years. At St. Angelo Hardwoods, we have become accustom the custom milling our modified lumber into decking, bench slats and other exterior components where stability and safe environmental practices are observed. Modification uses heat to remove organic compounds from the wood cells, so it will not absorb water, expand, contract, or provide nourishment for insects or fungi. The high heat produces a naturally durable wood that is permanently resistant to water, insects, and decay. Because the wood is not absorbing chemicals to be treated, but rather removing moisture, the wood is lightweight. Lumber is also more dimensionally stable when modified because it is less susceptible to cupping and warping. The wood has increased heat resistance and weather resistance as well. When properly maintained, it will not chip, rot, or warp over the years. Contact St. Angelo Hardwoods, Inc. for more information.